The fall season is all about gathering, entertaining and eating great food over great conversation, right? So what better place to do that than over your beautifully decorated dining table? We know that for many, the holidays bring an added stress of making everything "perfect," and we're here to help! 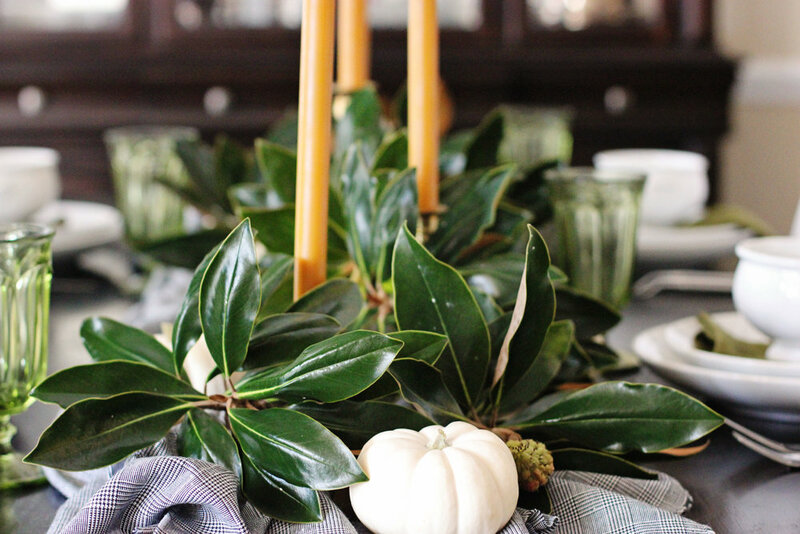 A beautiful tablescape doesn't have to be time or budget consuming. We're big proponents of using what you have and making it count. So we've both designed some easy table setups to share with you guys. I'll feature mine today, and Jessica will follow with hers. Let's get started! I started by laying down a piece of plaid houndstooth I found in the fabric bin at the thrift store for $3. Fabric isn't a necessity for a tablescape, but if you do want to use some, don't feel like you have to splurge on a table runner or tablecloth--sometimes a piece of fabric is just as good, if not better! I bunched mine to create some movement and texture in the middle of the table. Next I added my vintage brass candlesticks that I've collected over the years (largely at thrift and antique stores). Are you sensing a pattern? I love the hunt and thrill of a good deal! I swapped out my normal white tapers for some marigold ones for warmth and a nod to the traditional fall colors. Once I had my candlesticks spaced out how I wanted them, I started to add in the magnolia branches I clipped from the tree in my yard. Greenery is one of the easiest and cheapest (free if you can use trimmings from your own yard or a sweet neighbors!) to build a table centerpiece. I stuck to just magnolia on mine, but you could certainly use a variety of clippings for a more layered look. Next I added some mini white pumpkins I picked up on a trip to the grocery store for $1.50 each. Nurseries and farmer's markets are another great place to look for more selection. And remember, you don't have to stick to pumpkins. My grocery store had some beautiful green squash that would have been a fun choice too--and they were 99 cents! The next layer to the table was my dishes, which themselves got layered. Layer, layer, layer friends! I also added some green napkins and glassware that used to belong to my mom. Who said you can't use green for fall decorating? The finished product cost me $13.50 ($3 in fabric and $10.50 for pumpkins!). The best part is that it didn't take long at all to put together. When you're shopping for entertaining decor remember to look for pieces that you will be able to use in a variety of different ways for different events. That way the next time you have a function, you won't have to run to the store, just to your storage closet! Have you guys seen the new home of Natalie Morales from the Today show? She reportedly just purchased a home in Brentwood, CA for her new West Coast gig, and the listing photos are gorgeous. In case you missed it, I'll give you a mini tour of my favorite rooms. But first, let's all take in this beautiful back exterior. Would wouldn't want this to be the back of their house?? Look at all of those porches and windows! A simple and stunning entry greets guests when they walk in the home. I love those oversized sconces and artwork. This monochromatic transitional look has the best lighting in the house--natural lighting from those huge glass doors! I will never tire of those iron and glass doors. Again, there isn't a ton of color in the space, but that doesn't mean it lacks interest. The leather mixed with the wood, mixed with the iron, mixed the stripes...it's good. Now for the bedroom, a place of relaxation and rest. What's more fitting than calming, tone-on-tone furnishings? Me and my neutral-loving ways were instantly attracted to this monochromatic bedroom. It's very easy for a completely light room to look very sterile and flat, but the stagers here did a great job adding warmth and layers through varying textures. That's the key! I decided to do a "Get the Look" to show you how it could easily translate into your own bedroom. What's your favorite room? Comment below to let us know! Pinterest is full of beautiful rooms, right? Put what's the point of just looking at them, if you can't recreate them yourself? I pinned this room a long time ago but have come back to look at its understated beauty time and again. I love the simplicity of it, the layers and beautiful texture and the mix of modern and classic. You can't go wrong there in my book! I love it so much, I thought I should recreate a similar look for anyone else that may be fan too. If you have a room that inspires you, but need some help finding the pieces for your home, you're in luck! Our Ask My Designer service is about to launch. Ask My Designer bridges the gap between full room design and single item sourcing. Through AMD, we can give you tips on how to enhance your space and even help you track down the items to do so. You can read more about it here. To give you a quick update on our Bristol Park project, last week we were searching for light fixture options for the foyer. The ceiling in the foyer is sloped, so we needed a hanging fixture that could also be shortened to accommodate the ceiling height. The perfect choice was a lantern pendant in a matte black finish with clean lines. The combination of glass and black metal has a look of strength and elegance about it. As you have just seen from the images above, there are a variety of lantern pendants styles available on the market. Some look traditional and others more modern. You can get the look with these six pendants priced under $200.